Mama Nibbles: Marvel's The Avengers - In Theatres Now! Marvel's The Avengers - In Theatres Now! Have you seen Marvel's newest movie The Avengers? My husband and I have this thing where we will only see great action movie's in the theatre and for the others we wait until they become rentable. There is just nothing like seeing a phenomenal action packed movie on the big screen! We went to the theatre this past Sunday to view it and the seats were packed! The Avengers is THE BEST movie we have seen since 300. I was on the edge of my seat the whole time, my fists clenched, I could not move and my husband was I think the same way but I wasn't paying attention to anything else in that theatre. We did not see the 3D version because those glasses always give me a headache but honestly now I want to see the 3D, it would be worth it. I do suppose that if the building started burning down or a tornado ripped the roof off that I would still be glued to my seat, eyes pinned on the screen. I loved the amount of humor that had been thrown in, I literally laughed so hard that I cried. I cried tears of geeky joy as I watched my favorite super heroes. The actors really made them come to life and made me fall in love all over again. The Avengers broke box office history this weekend making $207.4 million during its 3-day opening weekend in the United States. You have just got to go see it in theatre, you will be happy that you did. Marvel Studios presents “Marvel’s The Avengers”—the Super Hero team up of a lifetime, featuring iconic Marvel Super Heroes Iron Man, The Incredible Hulk, Thor, Captain America, Hawkeye and Black Widow. When an unexpected enemy emerges that threatens global safety and security, Nick Fury, Director of the international peacekeeping agency known as S.H.I.E.L.D., finds himself in need of a team to pull the world back from the brink of disaster. Spanning the globe, a daring recruitment effort begins. Starring Robert Downey Jr., Chris Evans, Mark Ruffalo, Chris Hemsworth, Scarlett Johansson, Jeremy Renner and Tom Hiddleston, with Stellan Skarsgård and Samuel L. Jackson as Nick Fury, directed by Joss Whedon, from a story by Zak Penn and Joss Whedon with screenplay by Joss Whedon, “Marvel’s The Avengers” is based on the ever-popular Marvel comic book series “The Avengers,” first published in 1963 and a comics institution ever since. Prepare yourself for an exciting event movie, packed with action and spectacular special effects, when “Marvel’s The Avengers” assemble in summer 2012. 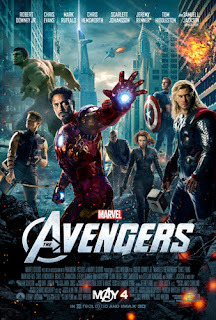 “Marvel’s The Avengers” is presented by Marvel Studios in association with Paramount Pictures. The film is produced by Marvel Studios’ President Kevin Feige and executive produced by Alan Fine, Jon Favreau, Stan Lee, Louis D’Esposito, Patricia Whitcher, Victoria Alonso and Jeremy Latcham. The film releases May 4, 2012, and is distributed by Walt Disney Studios Motion Pictures. (MARVEL STUDIOS) This film is rated PG-13.